ToneLib GFX – the perfect custom tone with a complete guitar studio in your computer! The really special thing about ToneLib-GFX is the amazing high quality of guitar amp tones achieved simply by plugging your guitar into a computer via an audio interface. 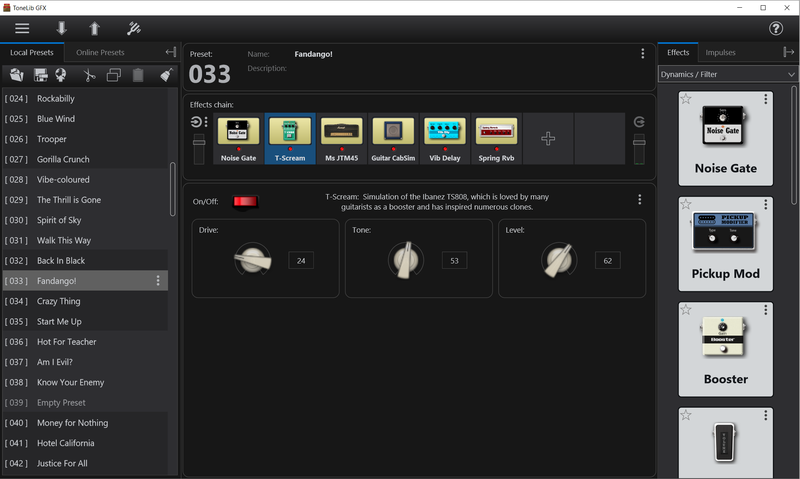 ToneLib-GFX gives you a professional guitar sound without the expense and hassle. For playing, practicing and recording guitar at home, enjoy pro-quality guitar sounds with headphones or studio monitors, any time of the day or night. For quality, versatility and convenience, this beats any traditional guitar amp. For the professional working studio or music producer, ToneLib-GFX can give your projects a top class guitar sound, streamline your work and give you more time to focus on producing great music. For the writing and performing artist, ToneLib-GFX gives you the convenience of working on your music when and where you need to. With inspiring guitar sounds instantly available, you can concentrate more effort on your guitar playing and your music. Download Tonelib-GFX and try it out! This is the best way to learn what it can do.